Then piece the block in the order shown at left. Alternate pressing directions by row to avoid bulky seams! 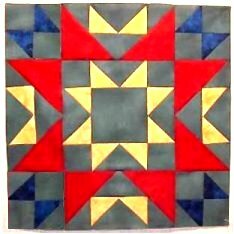 Here I show a quilt of Odd Fellow's Chain Blocks, set on point with half squares as edge filler, and as I was putting this all together on paper, I see that I would have really needed a more contrasting fabric for the background, still a green maybe , but lighter or darker ....welcome to quilting!! "I would have liked it better IF" .....and so, the learning process goes on! !